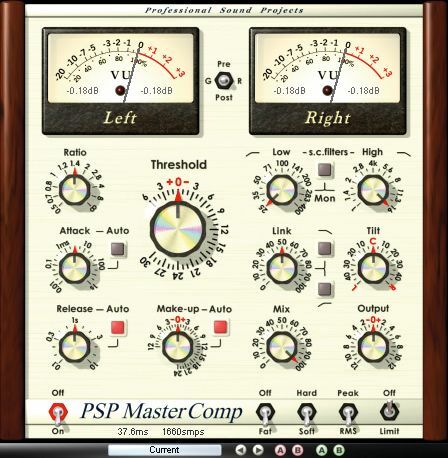 Straight outta Poland, does this PSP's release deserve to become your new favourite mastering compressor? Great value mastering tool that's also useful for any stereo track or group. Sounds great. Well laid out. Fantastic features. Good value. Sketchy manual. Guzzles CPU. Still not as good as Waves. The MasterComp has an intuitive and handsome GUI. It keeps faith to the old school feel with a modelled back panel. MasterComp is exactly what its name suggests: a high-quality stereo compressor and expander designed for mastering and other similar applications. Visually, PSP have wisely stuck to their winning formula - the interface features good looking meters that display VU and PPM levels (and their held values) and overload status. Below, all the standard controls are displayed (Threshold, Attack, etc) along with a few special additions. Specifically, we're talking about Auto controls for both attack and release - which will track the incoming signal and adjust accordingly - and an extra gain control and output brick wall limiter. A variety of switches offer bypass, pre/post metering, hard/soft, peak/RMS and suchlike and the front panel also plays host to a rather tasty sidechain section. Around the back is another PSP trademark - a VU calibration control section. Almost nobody (ourselves included) will adjust these, but it's good to know that they're there. Of course, we all know that the real measure of a mastering compressor isn't its GUI, so it's just as well that MasterComp sounds the business, too. The best way to get a feel for what this bad boy can do is to start with the presets - just apply an appropriate one ('Gentle Master' and 'Phat Mix' speak for themselves!) and tweak it. This is definitely a plug- in with one foot in the 64-bit processing future, and so you have the option to guzzle 2.5 times the CPU juice if you go for the full-phat processing experience. However, even our lowly Celeron 2.6GHz managed a healthy eleven instances before running out of breath - which is ten more than you'll need for mastering purposes. Running at higher power allows you to push the levels much more before the sound quality becomes damaged and there's something a little Waves L1-like about the transparency of this plug-in at extreme settings (although it's still not quite that good). Our one major criticism of MasterComp is its manual. Although it explains what each control is, it offers little insight into what they do or why they're useful. PSP clearly know what makes a good compressor and how it should be used, but it'd be nice if they didn't just assume that all their customers are similarly well-informed! Documentation aside, MasterComp is another winner from PSP. You honestly won't find better for less than £500.